Sadly, dance lessons don't come with this calfskin jacket. Marilyn Monroe’s white dress. The Beatles’ Sergeant Pepper uniforms. Dorothy’s ruby slippers. Some clothing becomes more than fabric and slips into iconic territory. 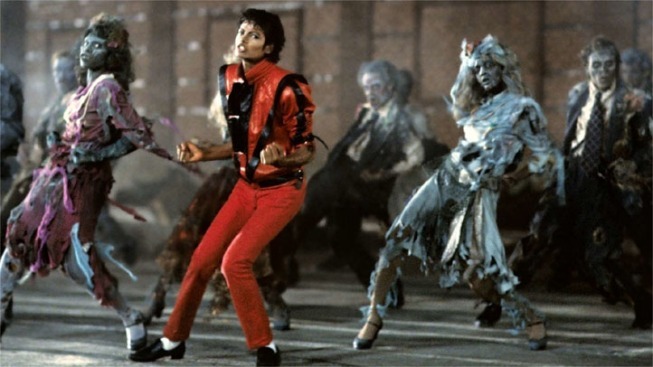 Such is the case of Michael Jackson’s legendary red leather jacket from the 1983 music video “Thriller,” where Jackson perfected his now famous clawed and undead zombie dance moves. It was sold for a staggering $1.8 million at auction this weekend, two years to the day since his untimely death. The jacket was expected to fetch a more modest sum at the Beverly Hills auction, from between $200,000 and $400,000, CNN says. Part of the proceeds will go to Jackson’s two Bengal tigers, Thriller and Sabu, who live at the Shambala Preserve. Jackson died in 2009 from an overdose of an anesthetic, which combined with other sedatives. He was 50 years old.